Good news! Three new reports have been embedded in SEOquake to deliver the best analytical results! Data from SEMrush's Backlinks, Display Advertising and Traffic Analytics reports is now shown in separate tabs in addition to the summary in ‘Parameters.’ SEOquake now provides more information than ever, and you’re all set for successful SEO analytics. To access the Backlinks report, you will be asked to connect your free SEMrush account. After doing so, your Overview report with all the most important metrics will become available. 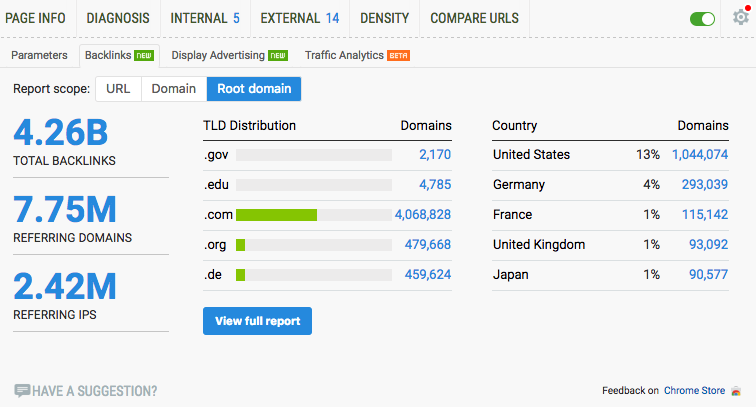 You can see data on specific URLs, domains or root domains. Our Display Advertising tool has recently been updated (check out the news). This report will show you how your competitors’ domains are being advertised. For instance, you can see the number of total publishers (websites that use Google AdSense to allow advertisers to run display ads on their site) and advertisers (websites that have placed ads on other sites in an effort to earn traffic). 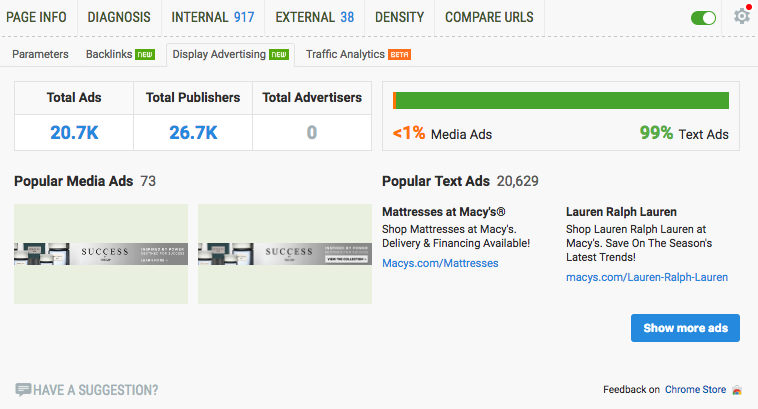 Previews of popular media ads and text ads are also shown in this report for your convenience. Finally, the last report provided by our recently created Traffic Analytics tool will give you full access to data on your competitors' domain traffic. 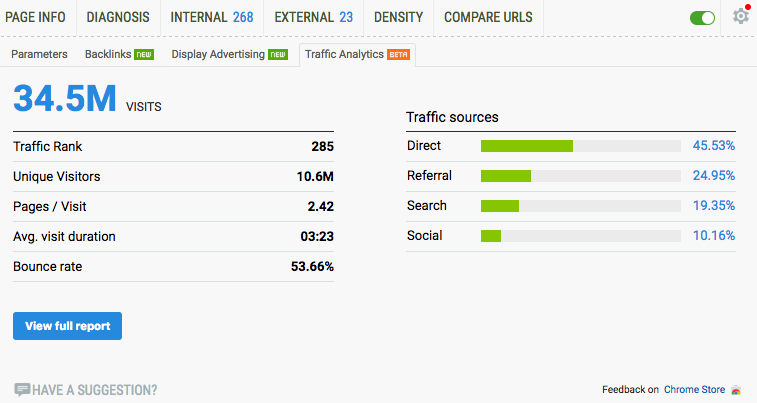 Use the ‘Traffic rank’ and ‘Unique visitors’ metrics to see common data concerning your traffic, and ‘Traffic sources’ to analyze the distribution of incoming traffic between direct, search, social and referral traffic acquisition channels for your competitors’ domains. In all reports, you can click on the ‘Full report’ or ‘Show more ads’ buttons to view detailed reports in the SEMrush interface. We'd love to receive your feedback on this update, so please send it to [email protected]. Thanks for helping us improve.